This site is intended to provide information and answer questions on the beautiful and versatile Haflinger horse, North America's fastest growing horse breed. It will also serve as a place where members of the registry may find forms and get updated information. The Welsh Pony and Cob Society was established in 1901 by landowners, farmers and those interested in the Welsh Breeds, who recognised the importance of documenting and recording the pedigrees of Welsh Ponies and Cobs. Friesian horses originated in Friesland—a province of The Netherlands (Holland). The Friesian horse, one of Europe’s oldest breeds, was originally imported to North America in the seventeenth century but the breed was totally lost in North America due to crossbreeding. The Friesian was not reintroduced to North America until 1974. One of a Kind Costumes for your Breyer or your Real Horses! She also does Renaissance and Period costuming for people. Check it out! Black Horse Studios, Horse Art for Horse Lovers! Fun "My Little Pony" stuff for kids, including games, arts & crafts! Do you LOVE horses? Doing horse games, horse puzzles, horse books and coloring horse pictures? Are you a 100% horse lover? - living and breathing horses and WISHING you owned a horse? Or that you could go horseriding every day? Do you want to learn about horse breeds and horse care and how to ride horses and ponies? Click here for all this and more!! 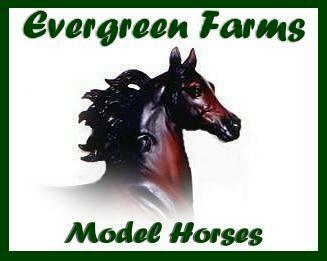 Evergreen Farms is home to more than 100 model horses. The focus of EF has switched from original finish Breyers to resins and customs, but the showstring still includes a number of OFs (both Breyers and Stones). I have put together a full online gallery of EF's custom models, which I will try to keep updated. However, because I have so many OF's, I have just selected a few favorites to share with you.